Home » Intermediate » Allusion: What Is It? You probably see or hear an allusion in use a couple of times a day, but do you use it in your songwriting? Have you had a moment when you’re hanging out with friends, and to jokingly give you a hard time, one of your friends references something indirectly you immediately recognize and understand. You have a common familiarity to the reference. However, in a song – your goal is to use an allusion that most people get so it can add depth and another layer of emotion to your song. An allusion is a form of imagery, which is a form of figurative language. An allusion is a reference to something that belongs properly to a world beyond the specific sphere of the poem. Often the reference comes from an historical or cultural context, but not necessarily. Its use is to deepen the definition of or extend the quality of something in the poem [song for us]. Example: referring to William Blake’s poem ‘The Sunflower’ or to van Gogh’s paintings of sunflowers would deepen and extend a perception of “any” sunflower in a field. Through the allusion, the values of literature and art are linked to the casual flower; through the allusion they shed their own intrinsic and valuable light upon it. In brief: It is an indirect reference of limited length to a person, place, thing or idea of historical, cultural, literary or political significance. It does not describe in detail the person or thing it is referring to – it simply suggests it. Allusions are used in songs to simplify complex ideas and emotions. They give the listener a comparative they can quickly reference in their own lives to better understand the song idea and the emotion the songwriter is creating. They also help create texture in a song. While you are showing a bit more vs. telling, and added some “furniture” – there is still a lack of texture. The whole scene lacks emotion and feels flat. That’s texture – the particulars that derive an emotional connection because there are details. Texture is particulars. So if I add particulars (texture) with figurative language like personification, metaphors, similes, or allusion, I can create a more meaningful scene for the listener. A wooden table is very different from my Great grandmother’s hand-me-down table. Now I’ve given some very particular detail about what started as a very generic thing – a table. The connection to the great grandmother has a significance in the song because the main character is going to think back on how the women in her life made her who she is. 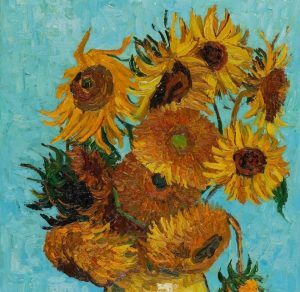 Staring at sunflowers is very different from “she stares out at the van Gogh sunflowers, how her grandmother painted her own every day” – you immediately visualize them in your head, and you get a sense of yearning the grandmother may have for being an artist. Maybe an unfulfilled life? Allusion is a device that allows you to add texture to your songs. How Can Allusion Change Your Song’s Texture? W hat if you hadn’t chosen an allusion to van Gogh’s sunflowers? 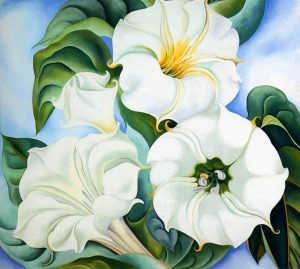 What if you had selected O’Keeffe’s Jimson Weed? How would that change your perception of the grandmother? Does her general character shift from being regretful and somewhat contemplative, to strong and purposeful in her focus on life? Because your selection immediately informs the character or scene you’re depicting, your choices are critical to getting the right message in the listener’s ears. That’s the power of an allusion. This will get you a Scooby Doo head tilt and “Huh?” from your listener pretty quickly. And, as soon as they’re not following what you’re trying to say (your message) they’re not listening. Let’s say in Taylor Swift’s “Love Story” song she had referenced Bonnie and Clyde rather than Romeo and Juliet. She now creates a very different relationship. There are no parents involved creating the “stay away from him” tension, and the imagery is not really her brand identity. If Charlie Puth’s “One Call Away” had used a different super hero, say The Tick, instead of Superman, the allusion would have seemed comic and not heroic at all. So – your choice matters. Choose wisely. Your best option for an allusion is one many people will get easily and quickly. You don’t want them to have to pull their phone out and Google Sir Ernest Shackleton or the Endurance because you’re trying to allude to a great leader of men. While he’s my #1 all day long – I would still go with Sergeant York, Nelson Mandela, Alexander The Great, etc. depending on the type of person I’m trying to portray – bravery, selfless, military genius. Billy Joel’s “We Didn’t Start The Fire” has an allusion in almost every line. However, they all tie to a single message. That’s key. Having a large number of allusions that don’t “fit” makes it hard for the listener to follow you. They will have to spend time figuring out what you’re pointing a finger at. If you use more than one in a song, make sure they work together. STEP 1: Pick the allusion first. You can use an image, like the apple and snake anchoring this post, or choose an historic figure or event. STEP 2: What does it “stand for”? Write it out. This will be your core message you’ll write to. STEP 3: Choose a plot, point of view and create your song outline. STEP 4: Write your song! Remember, this is an exercise. It doesn’t have to be the greatest song in the world. Try and get it written in 2 to 3 hours. You can always go back and make it better. If you’d like to see how some songs in the pop and country genre use allusion, read “Allusion In Songs: Billy Joel To Taylor Swift”.